No problems here. Did you perhaps disable BBCodes? Flemur wrote: t inserts the [size][/size] but the text between them stays the same size (in a preview anyway). Seems to work OK here. Just now shrunk mine to save valuable screen space. ...even for my old eyes it is very well visible. 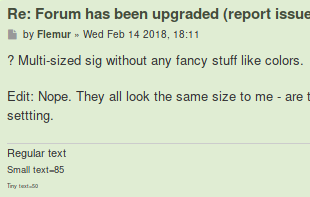 There seems to be a new issue, possibly from the forum upgrade. In some cases there seem to get html tags inserted, if a draft gets opened from the draft management in the user profile. I described, what I found out today here. Only in draft management on the UCP does it show internal representation. If I load the draft in a reply here it's showing the normal text and BBCodes. stays the same size (in a preview anyway). Edit: nope. Text all the same size.
? Multi-sized sig without any fancy stuff like colors. Edit: Nope. They all look the same size to me - are they (lines in the sig of this post) different sizes for anyone else? Maybe I have some funky browser settting. Problem is indeed on your end of the screen. When next upgrade happens (Next upgrade? We've only just performed this one! ), how do you feel about correcting a tiny, tiny caps/naming issue, 'Desktops & Window Managers' -> "XFCE", if not mistaken, should be written Xfce? 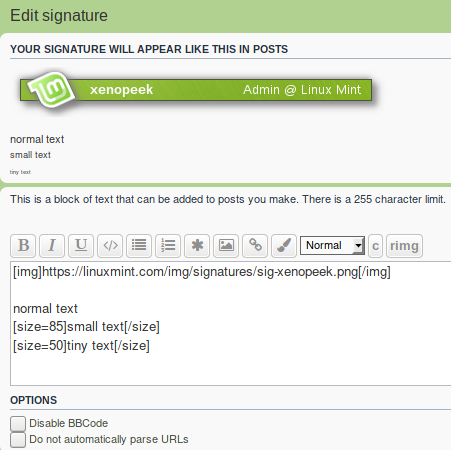 It appears correctly on linuxmint.com, so just a minor tweak needed here. Many thanks to you, and others for all your hard work. Yes so I noticed as soon as I logged in...my Avatar was gone. The strange thing was...in Edit Avatar all my settings were still there including my URL Image...so I clicked submit and got...URL Invalid. I did fix the problem by going to Postimage and uploading my image and pasting the link...which as we can see works. I did try Photobucket but I couldn't copy the link because they don't support Linux...you can upload and download but that's it. Did I say download...that doesn't work either...the downloaded picture wont open...support Linux you Bastards. If I login to Photobucket from my Win 7 VM the link works..which doesn't surprise me at all. Last edited by bob466 on Wed Feb 14, 2018 11:34 pm, edited 1 time in total. Incidentally, when is there going to be a automatic multi-quote function added to LMF? It would be nice to read through various posts in a thread and, in knowing you want to reply to a few, being able to flag the ones you're interested in and then have the board stitch that all together. Portreve wrote: It would be nice to read through various posts in a thread and, in knowing you want to reply to a few, being able to flag the ones you're interested in and then have the board stitch that all together. Whilst I agree with the idea, in my experience it will inevitably lead to posts with full quotes of several previous messages and could get messy. I think it would be better to remove the limit to the number of posts displayed in the editor window, allowing one to select text from any prior post in that thread and then click the corresponding Quote icon to add it, without having to edit each quoted post afterwards. I just have a minor problem when editing one of my posts. If the post I am editing is the last one in the thread it sometimes will post as a new message underneath the post that was edited instead of replacing the original post. I am quite sure I did not use " but the pencil icon. This does not happen when there are other new posts below the one I have edited or after a certain, unknown to me, amount of time. To work around this I have simply added a new post underneath... Consequently I have number of what look like double posts. I am not doing this to rack up my message count but it might look that way to some. I was not sure who to mention this to but there does seem to be a problem with the forum in that respect.